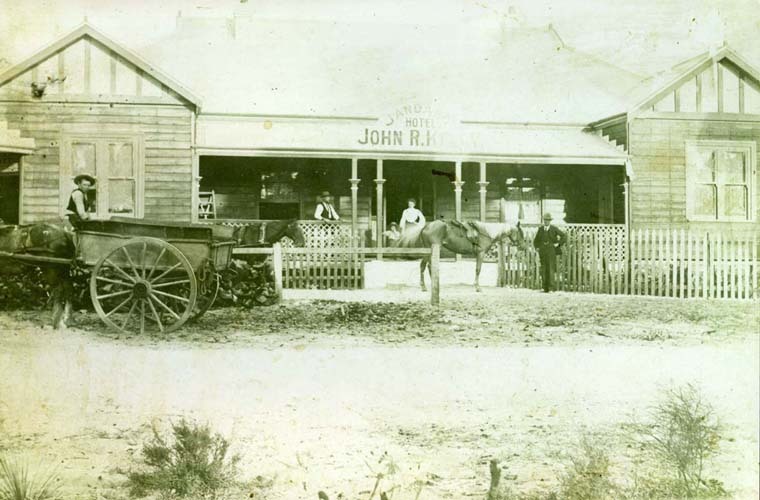 The Jandakot Hotel was built in 1902 by Walter Lawrence and John Ramsay, market gardeners of the Jandakot area since the late 1880s. Far removed from the bustling port and town of Fremantle, Jandakot Hotel served the settlers who had taken up residence in this newest part of the Cockburn district. Destroyed by fire in 1909 and rebuilt in solid stone, the hotel went through 15 licensees in its brief 25-year history, and has one of the most tangled and intriguing pasts of any hotel in Cockburn. Walter Lawrence and John Ramsay were partners in a market gardening holding on the banks of Yangebup Lake, which they had owned and run since 1888. By 1900 the Jandakot district was settled and prospering, and the two men clearly saw a need for a hotel to provide refreshment to the hardworking market gardening community. In December 1900, Walter Lawrence applied for a liquor license for a premises ‘on the corner of Forrest and Mason Roads’ (now North Lake Road and Mason Court), which was not yet built. The application was opposed by Reverend Robert Hanlin, Presbyterian minister at Fremantle, Beaconsfield and Bibra Lake, but the court granted the license regardless and Lawrence and Ramsay began construction. The hotel was up and running by May 1902 under the name “The Forrest Inn”. It had five sitting rooms and five bedrooms as well as living space for the publican and his family. Walter Lawrence was not granted his publican’s license until December 1902. Though liquor licensing laws were as strict then as now, the hotel was very isolated and it is not much of a stretch to assume that liquor was being served prior to a license being legally acquired. By June 1903 Lawrence had transferred his publican’s license to John R. Kelly and left behind the daily work of running the bar. It was Kelly who changed the hotel’s name to Jandakot Hotel in late 1903, and he remained licensee and leaseholder for another two years under Lawrence and Ramsay’s ownership. He advertised the hotel in the Fremantle and Perth newspapers as 'Five minutes’ walk from Bibra Lake - Spacious room for visitors with a piano'. In the only surviving photograph of the original hotel, it is Kelly’s name above the sign of the hotel, and his wife Mary with a little boy can be seen standing on the verandah. In 1905, Ramsay and Lawrence put the hotel and 10 acres of surrounding land up for auction, advertising it as “the well-known Jandakot Hotel in the centre of a rapidly rising neighbourhood”. There were 132 people living in the Jandakot district in 1905, up from 112 in 1903 - fairly prosperous for a market gardening community, but not a wildly exciting prospect for investors. It sold privately, before the auction date, to a Fremantle brewery named Port Brewing Co.
Three years later William Strickland, a managing director of the Port Brewing Co., and the director of Emu Brewing, bought out Port Brewing Co and became the owner of all its hotels and licenses. He remained the owner of the Jandakot Hotel until his death in 1927. In 1908, the publican’s license was transferred to Reginald Charles Glasson. Glasson had come from Northam to be nearer his mother Agnes, who had lived at Bibra Lake for some years, and he took over the lease of the Jandakot despite never having run a hotel before. His previous job had been as a cleaner at Northam Railway Station, where he was frequently cautioned for poor work and sleeping on the job. His mother came to live with him, and with her came a collection of parrots, canaries, and other caged birds. During his tenure Glasson was fined for watering down his rum. He was caught at this during an inspection by the Excise Department, and though he insisted a customer had done it when he stepped away from the bar, the magistrate was understandably unimpressed with this excuse and fined him £10. During the court case, the inspector stated that the Excise Department ‘was not aware until some days before the inspection of the defendant's liquor that such a hostelry as the Jandakot Hotel existed’. It is not beyond the scope of imagination that a lot more than watering the rum went on at such an out-of-the-way location as this. Two weeks after Glasson appeared in court for watering his liquor, the Jandakot Hotel burned to the ground. According to newspaper reports, at 2am on Monday, 29th November 1909, Glasson’s mother awoke to sounds of fire coming from the hotel kitchen, and within seven minutes the entire wooden structure was gone, along with the parrots and canaries and a good deal of alcohol and cash. There was surprisingly little speculation about the causes of this fire at the time. Glasson remained the licensee after this devastation, and was granted a renewal of his license on the understanding that he rebuild the hotel in three months. Rather astonishingly this appears to have been achieved: in May 1910 William Strickland, the hotel's owner, offered it for leasehold, advertising it as 'recently rebuilt', having two sitting rooms and three bedrooms - less than before, and probably still unfinished. times in the next year (from Glasson to John Murphy, Murphy to Joseph Breen, a boxing and sporting promoter who died three months into his tenure, and then to Robert Francis Hunter) until it was taken over by Fremantle hotelkeeper William ‘Billy’ Arnold in May 1911. In August 1911 Jack Visser, Billy Arnold’s old boss at the Oceanic Hotel (on Collie Street in Fremantle), took up the lease of the Jandakot Hotel as well, and thus began a partnership that brought stability and a love of sports to the district for some years. The Strickland connection rears its head again here: the Oceanic Hotel was another of his purchases from the liquidation of Port Brewery Co.
Visser and Arnold began inviting cricket teams to play the local Jandakot team on ‘one of the finest stretches of concrete for miles round’ - the well-kept grass pitch beside the hotel. From Fremantle port the Lumpers team travelled out to what was endearingly called ‘Sempleville’ (after well-known Jandakot resident, sporting all-rounder and cricket coach Robert Semple), and a team of Carters and Drivers made the same journey some months later. Teams often played for the right to be bought drinks and dinner afterwards at the Jandakot Hotel, which led to fierce competition and some rowdy behaviour. Visser was also closely linked with football clubs in Fremantle, and invited teams to come and dine at his hotel. His standing as a sportsman’s hotelier was so great that teams would travel all the way out to Jandakot even if they weren’t playing the locals: the Metropolitan Horsedriver’s Union Perth and Fremantle branches played each other at Jandakot twice in 1912, bringing their friends and families with them for an outing. With the genial, well-liked Arnold as host and caterer, these sporting days turned into anticipated events on a sparse social calendar. The hotel was so popular that in 1914 a social dance held by Arnold clashed with another held by the Agricultural Society at the Jandakot Hall, and most of the district chose the hotel instead. Arnold left the hotel in 1915, much to the disappointment of locals who were used to his good food and friendly service. James and Sarah Anne Kynaston, a young married couple, moved in, and remained licensees for three more years. In October 1916 Visser began to build a racetrack and grandstand beside the hotel. A keen turf-follower, he did most of the construction work himself - before hotelkeeping, he had been a carpenter by trade. For nearly two years Visser worked on the racetrack, but there is no documented evidence that he ever completed it or ran any official races there, despite a healthy horse training culture in nearby Hamilton Hill and several stud farms in Jandakot. In an interview in 1995, Cecilia Lazenby (born 1908) remembered races at Jandakot, but it is unclear if this was the same track. In 1918, the Kynastons transferred the license to William Hartley, a Jandakot butcher who moved in with his wife Mary and their three children Elsie, William and Ethel. The Hartleys had lived in Jandakot since 1913, and must have known the hotel well. Less than a year after taking up the license, William Hartley died. Mary took the hotel over and proceeded to run it for another six years, the longest term of any Jandakot licensee. Mary Hartley’s tenure at the Jandakot was uneventful. She and her children were already well established in the district and she was a regular on committees to plan dances and collect funds for charitable causes. Although she gathered the inescapable fines for trading outside regular hours, she was overall a solid and steady landlady for the hotel. Her eldest daughter married a publican as well, and after leaving Jandakot she went to live with them at the Davilak Hotel (now the South Beach Hotel on South Terrace). On Mary Hartley’s retirement in 1925, the licensed passed to James Clarke, a publican from East Fremantle. Clarke presided over the hotel’s final years, and got himself into trouble and a lot of unsavoury newspaper reports for allowing underage girls to drink at the hotel in late 1926. It is possible that this would not have shocked the district quite so much if the girls had not been travelling and drinking with Greek boys, a scandalous situation for a community that frequently prided itself on being white and British during this period. As it was, the gossip papers revelled in the story, and Clarke came out of the situation looking quite shady. During the course of the underage drinking court case in early 1927, another blow struck the Jandakot Hotel: owner and licensee were summoned to appear in front of the Delicensing Board to prove why they should not lose their license at the end of the year. This board was formed in an atmosphere of increasing tension between social alcohol consumption and the temperance movement that had been responsible for American Prohibition. The liquor inspector visited and reported that the hotel had two bedrooms available for the public, that the dining room was not in use and the hotel was ‘very modestly furnished’, with no heater in the bathroom and no electricity. All lighting was provided by lamps and candles. Local businessman Ernest LeQuesne of the wool scouring factory, gave evidence that his company, which already employed about 30 men in the area, was considering an extension into a flannel and blanket mill that would employ as many more again, about ¾ of a mile from the hotel. Jandakot’s champion Robert Semple gave evidence about the hotel’s necessity to families in the district, including an anecdote about a mother who had procured a glass of gin for her sick daughter which, according to doctors, had saved the girl’s life. The board asked Semple if he could not just as conveniently visit the Newmarket Hotel, and he ‘raised a laugh by replying that he was a believer in encouraging local industry’. None of this made a difference to the board, however, and on 13 April 1927 they announced their decision: the Jandakot Hotel (along with the Coogee Hotel) would not have its license renewed after December 31st. Like the Coogee Hotel, the owners struggled to find uses for a purpose-built pub that had been denied its liquor license. In truth, Jandakot had always been a gamble as a hotel site: small customer base, far from other centres of population, out of the way of travellers. The building became a white elephant. By February 1929, clearly without any luck, the property was advertised for sale or let again, this time with the added detail of an old orchard on the centre of the race course. In the early 1940s Evelyn and Harry Lucken, poultry farmers at Banjup, took up the hotel and ran a grocery store out of the front bar. The building was a private residence for many years, and it was purchased and converted into a Buddhist meeting centre in 2017.